Michael Jennings’ talk about globalisation at my home last Friday was both fascinating and entertaining. It’s tempting for a blogger to assume that because he has said all his stuff several times over, in about a hundred blog postings, that everyone who cares about it now gets it. But a talk that pulls a lot of it together actually tells even his most regular readers a great deal that they probably didn’t previously get. So it was last Friday. The basic point was that “globalisation”, far from being a great big steam-roller that flattens every individual local culture into ubiquitous uniformity, is actually a complex process, in which the supposed steam-roller is confronted by local forces that are often at least as powerful as the steam-roller and which oblige the steam-roller to behave very differently in each different spot. The result is not a simpler and duller world, but a far more complex and interesting and abundant one. In any given place, globalisation means that there will be far more to choose from, and each place, by shaping how globalisation happens locally, retains its individuality. It even becomes more individual and unusual, because of the extra layer of complexity and interestingness brought to it by foreign influences, locally modified. The particular example of globalised uniformity that people who have only visited a tiny few of the most famous Western cities regularly cite is fast food chains. But taste in food, whatever the food’s velocity, varies a lot from place to place, and if Mcdonald’s ever had a plan to impose total dietary uniformity upon the world, any such plan has long been abandoned. The simple McDonald’s hamburger mutates into any number of local variations for any number of local reasons, not the least of which is that in quite a few places ham is forbidden, never mind not liked. What and how people eat varied hugely from country to country in the past, and it still does. Michael’s style was of the anecdotal, feel-free-to-interrupt sort, so different listeners will remember different little illustrative stories among the many he told. My two favourites both concerned exceptions to the general point that Michael was making, exceptions which, with their oddity and rarity, prove the rule, as the rather odd saying goes. Because, both concerned global forces so overwhelming and irresistible in the force that they bring to bear on particular places that the quirks of that particular place really are powerless to resist. The first concerned teenage girls and their taste in frocks. I don’t know what happened at the recently concluded Oscar Ceremony, and mostly I don’t care, but maybe a particular lady costume stood out and attracted the admiring interest of global teenage girldom. If it did, then this week, teenage girls everywhere are going to be really wanting this dress. And a business which is alert to all this and which can thrash out and distribute copies of this dress on a huge scale and get them to all its shops this week is going to make a lot of money. Apparently, so Michael told us, this business is called Zara. Michael also mentioned the globally ubiquitous Mango, be he reckons Mango is not a real business, more an exercise in business ego fuelled by funny Spanish money, and that it will soon vanish. Zara is also Spanish, but a real business, based on its expertise in design and manufacture of course, but most especially in logistics. It knows how to get the right stuff into its shops really quickly, quick enough to satisfy Global Teenage Girl. Just how completely teenage girl tastes really do display this kind of global uniformity, I am not remotely qualified even to guess about, but here, said Michael, is a truly global force. And the other truly global force that Michael mentioned was Steve Jobs. Now recently deceased, of course, but still persisting as a force in the world, in the form of the continuing Steve Jobsness of Apple. Apple has created a range of products that millions around the world are hugely eager to get their hands on. Even people of quite modest means are prepared to spend a lot more to get the original Apple product, rather than any cheaper imitation. Apple, you might say, is the Rolls Royce of the not totally poor. I am personally engaged in purchasing a Google Nexus 4 smartphone, which is very iPhone-ish but which costs half what an iPhone costs. But for many millions around the world, nothing but the Apple original will do. An Apple Store arriving in your city is like a badge of global approval. Which meant that when Steve Jobs was visiting some huge city somewhere in Asia, like Beijing for instance, the questions were not: May I please build an Apple Store? And then: How does the new Apple Store have to change, to get past local bureaucracy and to cater to local preferences? Rather was the question: Is this city worthy to have an Apple Store bestowed upon it, in the exact form that Apple ordains, or not? (A delightful business example of one of my favourite archetypal processes, namely Reversing the Burden of Proof.) Whereas when McDonald’s opens up in a new and (for McDonald’s) exotic location, the question is how McDonald’s has to satisfy local bureaucrats and bend its basic template in order to make the new McDonald’s a success, the Apple question concerns what a city has to do and to put up with, to persuade Apple to manifest itself there. Answer: a lot. Or: no Apple Store. And hence the fact that in the Beijing Apple Store you can google for Tiananmen Square and read all about it, the only place, Michael asserted, where the Chinese government allows you to do this, as Michael proved by actually doing it, when he himself visited the Beijing Apple Store. Michael was not trying to give an in-your-face libertarianism-is-the-business kind of talk, but he left us all in no doubt that globalisation, at least as far as its commercial effects and processes are concerned, is a thoroughly good thing, never more so that when Steve Jobs is telling the government of China what’s what, but more generally and more typically, when people throughout the world are grabbing hold of globalisation and making it their own, so to speak. YO! Sushi sounds like something very global and homogenised, doesn’t it? Another fast-food steam-roller, this time constructed in Japan, even now forcing people everywhere in the world to eat the same debased and identical sushi food? Well, something like that may now be the plan, but actually: NO! YO! Sushi is British, most of its outlets being in London, although it does now seem to be venturing further afield, to such places as Moscow and Dubai. Don’t get Michael started on Dubai. Dubai, he told us last Friday, really is what a lot people think that globalisation as a whole is, namely lowest-common-denominator, brand-dominated homogenisation. Trouble is, Dubai is a Potemkin Village. “Global” businesses, which are global only in Dubai, are paid to operate in Dubai, catering to nobody except the vanity of the rulers of Dubai, who fantasise that Dubai is a global hub, or some such thing. Dubai, in other words, is a sort of localised Mango only more so. I was tempted to end this by saying “but I digress”, which in the matter of YO! Sushi (never once mentioned by Michael on Friday) I do. But the truth is that there is no “but” about it, in my mind, more of an “and”. The whole point of these talks is to provoke thought, in the minds of those who attend them, and for that matter in the minds of those who merely hear about them. They are intended to get us all thinking, and thinking beyond our usual mental comfort zones. Michael’s talk certainly accomplished this (comments from others who were present about other things that he said would be very welcome), and once again I thank him for it. I wouldn’t say Zara is a brand aimed at teenage girls, actually. It’s a brand that skews a bit older than that, and their stores have quite large menswear sections as well. The parent company Inditex has a number of different brands that are aimed at more specific market segments. You will often find stores representing half a dozen of their brands in the same mall or high street. Zara is probably their broadest brand – aimed at anyone from about twenty to forty – and has a reputation for selling clothes that are high quality and fashionable. The entire group has a reputation for responding rapidly and globally to trends. (“Rapidly” means within a couple of months, typically). A fascinating thing about Inditex is that the company comes from A Coruña (La Coruña in Spanish), in Galicia in the rather remote far North-West of Spain. All a chain store is, basically, is a store that did something well, so the management opened another and another, and one doesn’t have to be anywhere central to do it right the first time. There’s maybe a story of globalisation in that, too. Сушия on the other hand is Ukrainian. It’s similar to YO! Sushi in that it sells Sushi, most of its outlets are in the capital city Kiev in similar sorts of places to where you might find a YO! Sushi in London, and the food is good quality and good value. 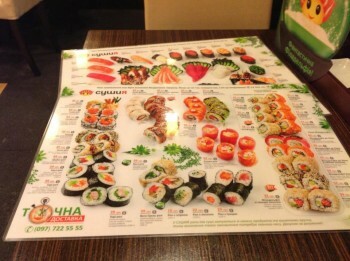 But the Ukrainian take on sushi is different to the British take in various subtle ways. If you are looking for a genuinely global and the same everywhere take on Japanese food, one could try Nobu. This is high end – investment banker / Davos attendee / Russian oligarch / global elite food. It has many of the same customers in its restaurants worldwide, possibly. However global it might be, though, it’s fairly hard to describe a chain consisting of 26 restaurants in only 20 cities as ubiquitous. I suspect it feels ubiquitous to its target market, though. That’s possibly a common fallacy of people who think that the world is suddenly the same wherever they go, though. It’s far more about them than it is the world. A quibble: Hamburgers are beef patties. But what you say is true; McDonald’s and other chains have quite varied menus in different countries and sometimes different locales within a country. The unfortunate part of globalization would appear to me to be a one size fits all approach to the legal system. That, and to where do you flee when the politics go sideways, as they inevitably will. McDonald’s have a core menu consisting of a small number of items that they try to make uniform throughout the world: cheeseburgers, Big Macs, Fries, a couple of the dessert items like hot apple pies. There are a few other things that exist in one way or another in most markets but vary a bit – there will always be at least one chicken burger of some kind, and then there is the Quarter Pounder / McRoyale, which has the same sized beef patty everywhere but varies quite a bit in terms of the other things in the bun with it. Often when they enter a new market, they will sell little more than this core menu initially, but they will later diversify the menu to cater to local tastes, to the extent that after they have been in a market for a while, 80% of the menu might consist of localised items. If you are a foreign visitor who walks in and orders a Big Mac with a Coke and Fries, McDonald’s will feel exactly the same everywhere, even though most people in different places may be eating quite different things. In particular, the balance of beef and chicken items on the menu can vary a lot, and can go far from American norms in places where poultry is generally eaten in preference to red meat. I have seen places where McDonald’s menu only has a couple of beef burgers but has four or five different chicken burgers to choose from. The more interesting cases (which I talked about) where situations where local dietary rules and tastes prohibit those core menu items. No cheese on the Big Macs in Israel. And no beef nor pork in India. In India they do a good version of the Big Mac with chicken, and in some places I believe they do or did a Big Mac with lamb, but I have not personally seen it. Certainly the prohibition on pork does affect the menu in Islamic places and in Israel, but this is somehow easier to replace with substitutes than is the case when you cannot use beef. Somehow the sausage in the Sausage McMuffins manages to taste the same in Europe, the Middle East, and in India, even though the meat used must be different in all these places. In a great many ways, the rest of the world that had been trying to join the industrial revolution is recapitulating the trials and turmoil of the western world, which trod that path in the 19th and 20th centuries. In some areas, they are able to profit from our experiences, and the ready markets for their goods gives them a leg up that the earlier pioneers didn’t have. It is not surprising, therefore, that many of the tired criticisms of, and ideological arguments against, industrial development are also being recycled from those previous centuries by the same collectivist cultists, now joined by various “new” groups disguised as environmental activists and child protection types. I would be more impressed with their hand-wringing and wailing about the evils of development if they had ever exerted anywhere near the same energy lamenting the back-breaking work and childhood deprivation of subsistence farming and low tech manufacture. It is long past time to strip away the false veil of moral superiority these toadies wear, and expose them for the ideological fanatics they truly are, and always have been. If they actually represented any concern for the welfare of ordinary working people, the places where their social-engineering regimes held power would not consist of gruesomely polluted land, air, and water, and earth soaked with more blood than any evil industrial abattoir. In the future, the middle and commercial classes these developments are creating will force their societies to undergo enormous, fundamental reforms. The autocrats in various countries trying to control the development, while maintaining their corrupt systems and their positions in them, will be unpleasantly surprised to find that those shopkeepers and factory workers are the very revolutionary force their twisted ideology always claimed they were, but not in the way they imagined. The power of the powerless is the only true, and irresistible, power in the world. While I agree with the thrust of what you say, I do wonder how you arrive at a Nexus 4 being half the price of an iPhone. An iPhone 4 (what I still use myself) with 8 GB is available for $599, an iPhone 4s with 16 GB for $899, or the latest brand spanking iPhone 5 with 16 GB for $1049. Even if you want the very latest iPhone you’re only talking 50% more, not double, and older models are available for prices quite comparable to the Nexus. All prices include 15% GST and are for contract-free unlocked phones. Sausage can taste the same in multiple countries and cultural regions if it is made of Soylent Green. Cheapest iPhone 5 (from Apple Store, 16gb, unlocked and SIM free) = £529 with free shipping. The Sushi bar in Jerusalem airport seemed to being doing well. There may be something to this globalisation thing….. The saying is only odd if you interpret the word ‘prove’ as its most common modern meaning, as in proving that something is true. In the context of this saying, the meaning of the word ‘prove’ is to put to the test. The exception that puts the rule to the test.